Polaris Rock Salt with its famous quality is one of the most desired deicing substance on earth due to its geological formation in side siwa soils, where siwa considered to be a version un polluted natural reserve in Egypt, the salt is crystal clear and high concentrated with Sodium. .Polaris Siwa Rock Salt really Rocks. AMTC started its Rock Salt trading operations few years ago, and achieved firm steps towards expanding in USA and Canada Markets. Recently, AMTC Started mining operations for the Egyptian Deicing Salt in one of the best spots all over the world which is Siwa oasis in Egypt producing a premium grade Egyptian Deicing salt with purity 99.2%. Egyptian Rock Salt is considered to be one of the most efficient de-icing sodium chloride products available anywhere. AMTC de-icing salt is ideal for highways, roads, runways, or any other Vehicles surface. Short on time? Let rock-salt sellers contact you. please be noted Nida Trading Export of Himalayan Rock salt, Cooking salt animal liking salt. We are offering the world best natural salt Call us now for your wholesale or bulk order and enjoy our Best export rices for worldwide orders Natural. We are regularly exporting All type of Salt Cooking, industrial Refined or bulkRocks to East Africa West Africa South Africa and many Land Lock African Countries Including Djibouti Port Sudan Ethiopia Kenya Zaire Tanzania Botswana Zambia Mozambique Cotonou Benin and several other West African countries under development Middle East GCC Countries including Jebel Ali Abu Dhabi Muscat Doha Um e Qasr Bahrain Kuwait Sharjah Basra Port Rashid Shuaikah Port and other countries in Middle East We are interested to work with your esteemed company for Salt Trade from PAKISTAN If you are looking for Salt Please advise me. 1 Packing required 2 Mode of payment 3 Quantity required 4 Probable shipment date 5 Destination Port, 6 Colouring Pink / Dark Pink. We are offering the world best natural salt Call us now for your wholesale or bulk order and enjoy our Best export rices for worldwide orders Natural. We are regularly exporting All type of Salt Cooking, industrial Refined or bulkRocks to East Africa West Africa South Africa and many Land Lock African Countries Including Djibouti Port Sudan Ethiopia Kenya Zaire Tanzania Botswana Zambia Mozambique Cotonou Benin and several other West African countries under development Middle East GCC Countries including Jebel Ali Abu Dhabi Muscat Doha Um e Qasr Bahrain Kuwait Sharjah Basra Port Rashid Shuaikah Port and other countries in Middle East We are interested to work with your esteemed company for Salt Trade from PAKISTAN If you are looking for Salt Please advise me. 1 Packing required 2 Mode of payment 3 Quantity required 4 Probable shipment date 5 Distination Port, 6 Coloring Pink White. Thanks & Regard. Rock Salt We are pleased to offer our company as one of the companies working in the file of mining, loading and Exporting Egypt. We export raw materials, following from the ports of Egypt all over the world Excellent salt for our customers - that is our claim. As mining company with a tradition spanning more than 5 years we put our know-how at the service of our customers every day. We know what has to be done to deliver a natural product in different granulations and packaging both throughout Europe and all over the world. 1- Rock salt: 99.2% sodium Chloride. Available for all uses. 2- Marine salt: 90% sodium Chloride. Available for roads and icing. 1-Bulk loading. minimum load is 5000 tons per load. 2- 25 kg bags in 20 feet containers. We can provide you edible rock salt (food grade) in pinkish and white colours from world famous salt mines Pakistan, in. mesh form, size 20and 30. Packed in bags of 25kg or 50 kg. Abid Hussain & Co (pvt) Ltd. This natural rock salt contains a minimum of 99% of nacl (sodium chloride) , other soluble salts are not more than 0.56% and ph reaction is neutral. The salt can be suplied as iodized or non-iodized In 50kg packings. 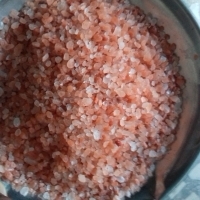 We can provide Authentic Himalayan Pink Rock Salt directly from the mines. This can be in bulk packaging (20Kg Bags) or in smaller quantities. The salt can be supplied as chips which retains the pink color of the salt or it can be in ground form for cooking. We can also provide the salt in your defined packaging with your company or trade name printed on it. The above indicated price is per Kg without packaging and ex-factory. All inquiries are welcome.